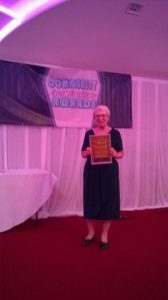 Hospice ward volunteer and Hospice Neighbour Co-ordinator Patricia Langham-Service has been honoured at the Community Inspiration Awards. Patricia, who was nominated in the Good Neighbour Award Category, was announced as runner-up at the ceremony on Thursday 28 July 2016. The awards, organised by the Community Foundation, recognise outstanding contributions made by staff from public sector organisations and members of the community, like Patricia, whose efforts have made a positive difference in the community as well as inspiring and motivating others. Patricia volunteers at the Hospice, as a Receptionist on Sylvan Ward, and as a Hospice Neighbours volunteer and Co-ordinator.